The project to renovate the Bay Bridge could be headed back to the drawing board after some Pensacola officials expressed misgivings at a perceived lack of concern for resident safety and an increased risk for car accidents. Officials are eager for a new bridge, but not at the cost of access, or lives. The plan calls for two bridge spans, and using the current, old one in the interim to handle overflow while they’re being built. 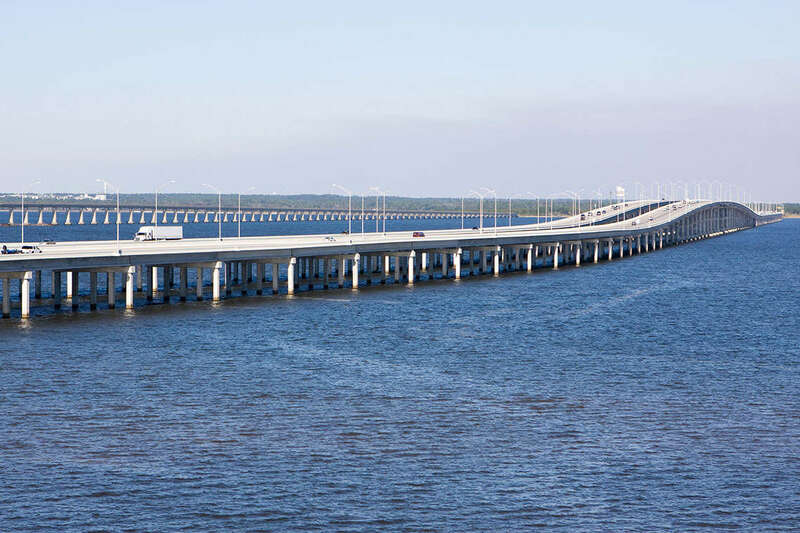 Shaving down several feet from the bridge’s lanes and shoulders will help the Florida Department of Transportation accommodate more traffic during their construction of the second span, according to the Pensacola News-Journal. But the result is less space for drivers, and if the worst happens, emergency vehicles might not be able to access the bridge at all. The Florida Department of Transportation is now looking into new alternatives, but here’s what the initial plan looked like, and how FDOT has fared in its bridge-building endeavors elsewhere in the state. The Bay Bridge project is set to start next month, but with the News-Journal reporting FDOT hasn’t finalized a bridge design or traffic plan, some might speculate the plans will be delayed until a solution more accommodating to the cities arises. The problem with the plans to renovate Bay Bridge is that it only has four lanes, and during construction, when only one span of the Bay Bridge is built, the traffic pattern will have to be adjusted while the second span is completed. The span will still have four lanes, but each one will be shortened anywhere from a few inches to a few feet. Making bridge access impossible for emergency services is one of the most serious complaints FDOT is facing. FDOT’s original suggestion that every alternating 1,000 feet of bridge could feature a pull-off strip for car accidents to the News-Journal. FDOT responded by offering narrowed lanes and shoulders, which still drew a mixed response from Pensacola and Gulf Breeze officials, with the Gulf Breeze Police Chief questioning the viability of reaching accidents on an already narrow bridge. Building bridges is one of FDOT’s biggest mandates, but with the Bay Bridge, they can’t seem to get it to the city’s specifications. Elsewhere, they’ve been having a similar problem. Pensacola isn’t the only city in Florida feuding with FDOT over poorly thought-out bridge plans. The Howard-Frankland, one of the Tampa area’s stalwart traffic funnels between Pinellas and Hillsborough Counties, is seeing its designs also return to the drawing board. The viability of FDOT’s plan in Tampa Bay — which was revealed to reduce the number of general access lanes by adding a toll and simply reclassifying another — was cratered as soon as officials realized the number of lanes promised to deal with increasing traffic wasn’t going to change, according to the Tampa Bay Times. Tolls aren’t an issue for the Bay Bridge, but the News-Journal noted Pensacolans had other concerns, like pedestrian and cycling access. The protected bike and walk lane the bridge would have had isn’t the same height as the rest of the structure, a fact the Gulf Breeze mayor was quick to decry as an element that came out of nowhere. Adjusting to the mayor and others’ desires for such a change means more FDOT planning. Similarly rigid in his desires is the Jacksonville mayor, who is ramping up plans for the city’s waterfront. The move is seen as a revitalization effort in an area where industry has come and gone. FDOT’s interest in being involved in changing part of (or destroying, a feeling the mayor has expressed) the bridge’s configuration is only somewhat warm, according to the Jacksonville Business Journal. The Bay Bridge project is receiving more attention than the J-ville mayor’s Hart Bridge dream. FDOT has already contracted with Skanska and met with city officials several times to discuss the impending construction. With some luck, the parties might work out the kinks soon. Until then, the bridge will be as crowded as ever. With FDOT having declared it structurally deficient, keeping up with the bridge plan progression and staying on the lookout for danger is the best course of action. Pedestrians, cyclists, and drivers will all be affected by the construction on the main artery between Pensacola and its coastal enclaves like Gulf Breeze. Traffic will likely increase, and with it the likelihood of an accident. Our car accident attorneys in Pensacola are knowledgeable about all kinds of car accidents, and might be able to steward your claim through the complex insurance process and court system to get you the compensation you need. Fill out our free, no-risk case evaluation if you’re ready to seek an attorney today.